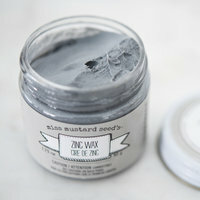 Zinc Wax is a fine museum quality wax is based on an old family recipe. It is made from Beeswax with a little Carnauba Wax and is then tinted a creamy medium grey, perfect for creating an aged, faded or galvanised metal look on a piece of painted furniture. It is easy to apply, provides a durable finish with a beautiful luster and has almost no odor. Use a clean cotton cloth or brush to apply wax in a thin layer, working into recesses of carved details or surface imperfections. Wipe away excess, allowing wax that has built up in recesses to remain. Allow it to dry for 3-5 minutes. Buff to a shine with a clean lint-free cotton cloth. This product may be applied directly over dry milk paint or clear wax and does not require an additional finish. Clean brush with soap and warm water. 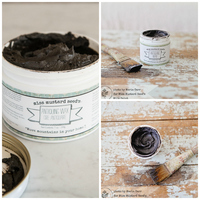 This wax is created exclusively for Miss Mustard Seed by Claphams Beeswax Products in Canada. This fine museum quality wax is based on an old family recipe. It is made from beeswax with a little carnauba wax. It is ideal for use on wood, marble or as a finish over Milk Paint. It is easy to apply, provides a durable finish with a beautiful luster and has almost no odour. Use a clean cotton cloth or brush to apply wax in a thin layer. Allow it to dry for 3-5 minutes. Buff to a shine with a clean lint-free cotton cloth. For additional shine and durability, apply a second coat. Clean brush with soap and warm water. This fine museum quality wax is based on an old family recipe. It is made from beeswax with a little carnauba wax and is then lightly tinted to a rich brown, perfect for creating an authentically aged finish on a piece of painted furniture. It is easy to apply, provides a durable finish with a beautiful luster and has almost no odour. Use a clean cotton cloth or brush to apply wax in a thin layer, working into recesses of carved details or surface imperfections. Wipe away excess. Allow it to dry for 3-5 minutes. Buff to a shine with a clean lint-free cotton cloth. 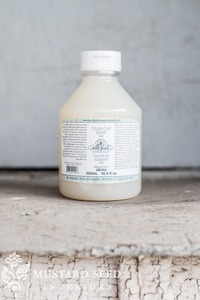 This product may be applied directly over dry milk paint or clear wax. Clean brush with soap and warm water. 100% Beeswax Finish. Can be used as a sealant for milk painted surfaces or as a finish for raw or stained wood. This all-natural, food safe wax can be used on wooden cutting boards, utensils, butcher block counters, salad bowls, children’s toys, etc. It can also be applied over oiled furniture (i.e. Danish Oil) for added protection. This solvent-free oil finish provides a protective, water-resistant surface. 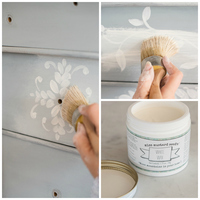 Use on new wood that is bare, stained, Milk-painted or to revive old wood finishes. It penetrates to protect from the inside out. Does not leave a surface film that will chip or scratch. This food-safe oil finish is perfect for use in the kitchen on wood or stone. Used outside, it can restore the luster of old oil based paint or revitalize surfaces such as cast iron. Test on an inconspicuous spot prior to using on an entire piece. 250ml covers approximately 25-40 sq. feet. Soap and water cleanup. This premium, non yellowing tough coat provides extra durability against general wear and tear, water damage and food stains. Perfect for those high traffic surfaces such as table tops, seating, doors and floors. Apply with a roller, damp lint-free cloth or brush onto recently painted or clean, non oily/greasy surfaces. If applying to a recently painted surface, allow the surface to dry 24-36 hours before applying. For maximum durability, apply two coats waiting 2-4 hours between coats. In humid areas, longer drying times may be required. 500 mL covers approximately 75 sqft. Easy clean up with soap and warm water. Dries to a satin finish. Shake well to disperse matting agents prior to painting and dilute with a little water if thinner application is desired.